Flooring America offers superior flooring and carpeting from first-rate companies in Switz City. We uphold a superior reputation by offering high-quality flooring, low prices and professional experience you can rely on. Locally owned, Flooring America is dedicated to installing the right type of flooring for your home. Our team will create an enjoyable experience every step of the way! Vinyl floors are a top flooring option because of its durability. It resists high impact and is ideal for active households. Amongst all types of hard surfaces, vinyl flooring offers the softest surface. A vinyl floor is ideal for kitchens, bathrooms and playrooms. Types of vinyl flooring include no-wax, urethane and enhanced urethane. Each type offers different benefits. Enhanced urethane stands up to scuffing, grime and cleaning solvents. 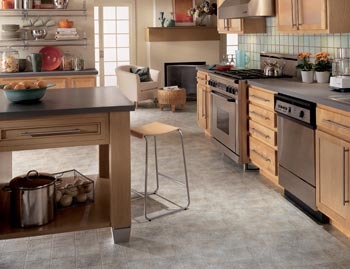 Flooring America’s specialists help you with your flooring needs from beginning to end. During an appointment, we will listen to what you want and offer excellent suggestions. We will pick premier flooring based on the qualities that are most important to your household, such as pricing, stain and scuff resistance, low maintenance and style preferences. After the project is complete, our professional consultants can offer excellent floor-care advice. Our expert information can help prolong the life of your floor and keep it looking great. Make a consultation with a Flooring America professional in Switz City today and we’ll help you install the vinyl floor you’ve always dreamed of! Call <PHONE>. We proudly serve the communities of Switz City, Linton, Bloomfield, Odon, Lyons, Elnora, Worthington, Jasonville and Duggar, Indiana.